The time has now come for me to reveal further details for Dreddcon 2002, the annual celebration of all things related to the Galaxy's Greatest Comic and the future's hardest lawman. The guest list grows ever longer, with many more names still to be announced in addition to the list below. 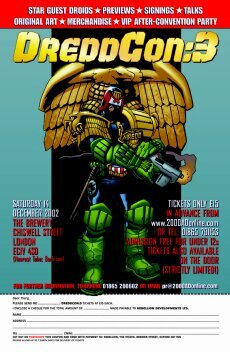 Dreddcon will take place over three rooms at the Brewery, near the Barbican in central London (www.thebrewery.co.uk for further venue information), on Saturday 14th December, from 9am until 5pm, with an after-event party (and daytime refreshments) at The Vaults pub, just across the road from the venue. The largest of Dreddcon's three rooms will host the dealer hall, which will contain a mix of general comics dealers, 2000 AD-related companies such as Titan, Mongoose and Big Finish, and many 2000 AD creators will be running their own tables, where they will be selling original artwork, copies of their published works, and will be sketching and signing for Dreddcon attendees. There will also be a talks room, where legendary raconteur and convention guru Kev Sutherland will be compering a day of talks and panels with a selection of editorial, art and script droids, in addition to a couple of film showings courtesy of our colleagues at Manga during the quieter parts of the day. The final room will feature events of a more practical bent, including technical demonstrations, masterclasses, slideshows and other such wonders from a variety of comics creators, plus other guests from related fields such as film prosthetic effects and broadcast media. My event-organising droids can be contacted if you need any further information on 01865 200 602/606, or by emailing markc@rebellion.co.uk or dominic@rebellion.co.uk. More information will be forthcoming as it is confirmed as we approach Dreddcon.